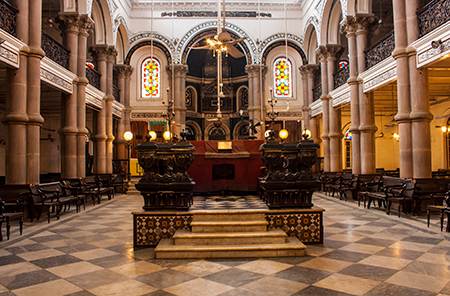 Kolkata’s 133-year-old Maghen David Synagogue. You could call it traffic, the dizzying crush of cars, bicycles, taxis, trucks and handcarts on Brabourne Road, the street that leads to the Maghen David Synagogue in Kolkata (formerly Calcutta). Unable to cross, I am standing at the corner, gaping at the synagogue’s steeple that pokes up unexpectedly into the sky like a lofty wizard’s hat. Despite its solid brick-red façade, it seems almost a mirage. The Indian city I left for America with my family as a child of 6 has bewitched me like a distant lover for much of my life. I have returned twice before with family, and it’s been eight years since my last visit. This time, in 2015, I am leading a group of 20 travelers on a tour of Jewish India; they will witness my homecoming, the most personal part of a broader tour of the Indian subcontinent. My heart is a brew of emotions as we turn down Canning Street. The heft of the Maghen David synagogue rises dramatically in front of us with its layers of red and beige stone, its steeple buttressed on top of a clock tower that will tell you it is 12:20 from any of four directions—no matter what time it really is. Before we enter the synagogue through the wooden doors that the Muslim caretaker has unlocked, I pass a plaque noting my father’s role in organizing Maghen David’s centennial celebration in 1984. My father, Ezekiel Nissim Musleah, was rabbi of this once-flourishing community from 1952 to 1964, the only officially ordained religious leader since the first settler arrived from Aleppo, Syria, in 1798. Over the next 150 years, Baghdadi Jews fleeing persecution and seeking fortune in the capital of the British Raj fattened the community’s ranks to about 5,000, but the numbers thinned out following the chaotic partition of India and Pakistan in 1947 and, a year later, the creation of the State of Israel. A few people await us inside the synagogue, including a one-time girlfriend of my father’s and a former student of his from the Kolkata Jewish Girls School. Others remember my mother, Margaret. Excited, they crowd around me, introducing themselves. I turn toward our family seats—or at least, the benches where the male members of the family used to sit. I see the lidded wooden box that used to hold their personal siddurim. My father had told me where to find the key to unlock the box but I don’t need to. It’s open, and empty, except for the smell of camphor and a stray camphor ball that had once protected the books. I weep. Rahel sits in her father’s seat in the Maghen David Synagogue. Composing myself, I look around at the building that was constructed 133 years ago and that served as a religious and professional home to generations of my family: It is even more beautiful than I remember it. The entire synagogue is lit up and though we have visited a dozen Indian synagogues on our tour, Maghen David’s grandeur and beauty are unsurpassed. Above the Ark are the biblical words that capture the space like no other: Mah norah hamakom hazeh. How awesome is this place. In the room that once gleamed with 75 sifrei Torah in their silver cases, I kiss the two that remain, bequeathed for eternity by the synagogue’s founders. I walk around and touch everything—even the grime that now marks the walls seem holy somehow. Members of the community had invited me to lead the evening service, that night making Maghen David one of the few egalitarian Sephardic synagogues in the world. “I do not believe that HaKadosh Baruch Hu finds a man’s baritone more pleasing to the ear than a woman’s soprano; surely both are equally acceptable to Him,” explained Jo Cohen, 70, one of the community’s administrators ; she is of French and Portuguese descent and converted from Catholicism when she married in 1970. I had learned to chant the Baghdadi melody from a recording my father made, trying to follow his every note carefully and rendering my version of his quartertones. But then I had to find my own voice. I ascend the tebah (bimah) where my father, grandfather and great-grandfather had stood. My voice soars and echoes in the vast space and brings the synagogue alive. Mah norah hamakom hazeh. Though there is rarely a minyan in any of the city’s three synagogues—and there are only 18 stalwart Jews left in Kolkata—tonight there is a minyan. After the service, we sing traditional liturgical songs and “Gesher Tzar Me’od”—Rabbi Nahman of Bratslav’s transcendent words in Hebrew, followed by a Hindi translation, “Yeh sari duniyah, ek chota sapul.…” The whole world is a very narrow bridge, and the most important thing is not to be afraid. The words originated in the Ukraine, but they could not be more appropriate. I feel myself a bridge, linking past and present, East and West. Earlier in the day, looking for my links to the past, I walked with my group along Bowbazaar (now called BB Ganguly Road) toward No. 11, where my father grew up amidst an extended family. We called my great-aunts and uncle “the Bowbazaars” and their home, No. 11. But my last relative passed away in 2006 and I wondered what I would find. Memories from my previous visits are thinly veiled by a scrim of anticipation and trepidation. We passed the rickshaw wallahs—Calcutta is the only city in India that still permits the hand-pulled carriages—and the snack–sellers deep-frying samosas and puchkas filled with potatoes and chickpeas. Jewelers, optical shops and typists with old-fashioned machines catering to illiterate customers line the street, and a sign tacked to a tree advertises surgery-free cures for “piles, pissures [stet] and fistulas.” The mistake is funny—until I think about the poverty and health issues it signifies. Finally, we arrived at No. 11. A sign with my grandfather’s name used to hang at the entrance, but the house that the family had rented for decades had reverted back to its owner. A friend had brought the sign to me and I had hung it above my desk at home. Yet standing at the entrance, I foolishly expected I would still see it. I left, disappointed. 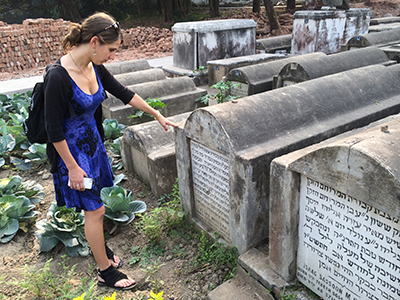 At the Kolkata Jewish Cemetery the next morning, I thanked my great-grandfather for the sweet voice I was told he had, and which I hope I had inherited. I leaned down and told my grandparents, whom I had never met, that I had visited Bowbazaar, that I had sung for them in Maghen David and that I carried them everywhere with me. Shoshana pays respects to Flora, her great-grandmother and namesake. One year later. I am back in Kolkata with another group. This time my daughter Shoshana, 23, accompanies me, her first trip to India. It is eye-opening to see everything through her eager youthfulness and, at the same time, her profound maturity. I take her to the family landmarks. I am wiser now, so we have made an appointment at No. 11. The long rows of office cubicles provoke a sinking sense that we have come on a wild-goose chase—until I describe the veranda that once housed the sukkah. Suddenly, a set of keys is procured and a concealed door in the wood-paneled boardroom opens to reveal another door, this one slatted and dingy green, and then the screened-in porch. I feel vindicated. When the manager brings us tea on the veranda, the atmosphere changes. We are not strangers here anymore. For Shoshana, the experience is one of trying to find connection. “I thought about all that had changed—but the history was still there in little hints of home,” she says later, acknowledging that despite the many stories she had heard it was difficult for her to feel connected with people she had never met. We visit the cemetery, especially the grave of my grandmother Flora, for whom Shoshana is named. The vegetation that used to sprout untended amidst the forest of blackened, aboveground tombs has been cleared with machetes and we walk straight back to the family plot. (My maternal grandparents are buried in London; they moved there in 1960.) Many of the inscriptions have faded, but the words on my grandparents’ graves are vivid. “I didn’t know my ancestors,” Shoshana says, “but I felt I could make them proud by who I’ve become. I was thinking, ‘Would they like me?’ I do know Saba, and I could only imagine where he got his compassion and helpfulness and tradition—from his family.” We put some stones in our pockets to take back home to my parents, as if the rocks could vicariously transmit the powerful spirit of that moment. Before Shabbat morning services at Maghen David that I am again privileged to lead, Shoshana sits in her grandfather’s seat and I sit in my grandfather’s seat—mirroring how my father and I sat here almost 20 years earlier. “I tried to channel Saba the child,” she says, wondering if he daydreamed when he sat by the open window. She is awestruck by the synagogue’s beauty and the energy she feels still coursing through it. In the balcony we find my mother’s seat. Shoshana has prepared a short aliyah, “a rite of passage,” she says. She has not read Torah in seven years, and though she is nervous she is inspired by her savta’s dedication to reading Torah—she learned to read when she was 65. Wrapped in the talit I made for her bat mitzvah with my sister’s help, sitting in the place her grandparents had started their lives together, she feels surrounded by family. The words she chants describe the way the children of Israel carried their knapsacks filled with matzah on their shoulders as they left Egypt. As she stands before the open Torah, the eighth generation of our family in India, the words she sings resonate beyond their original meaning. Misharotam tz’rurot b’simlotam al shichmam. We carry our heritage with us. It can hardly be a coincidence. Rahel Musleah, a frequent contributor to Hadassah Magazine, runs Jewish tours to India and speaks about its communities. Preserving the legacy of the community is not my mission alone. For those on the ground, repair and restoration is paramount. Several boards administer the remaining Kolkata institutions, many of which have resources from trust funds established with philanthropic bequests. Contiguous to Maghen David, a smaller sister synagogue, Neve Shalome (1912), had for years lain forlorn and decrepit. It had become a shelter for homeless squatters, but now it has been restored it to its former beauty. Maghen David and the third synagogue, Beth El (1856), are being repaired. The buildings have been declared heritage sites by the Archaeological Survey of India, the government agency that oversees them. Three Jewish schools run by a Jewish board of trustees—the Jewish Girls School and two branches of the Elias Meyer Free School and Talmud Torah—boast hundreds of students, almost all Muslim. Monthly stipends, free medical care and hospitalization are also available for the needy. “There is no end to projects,” says Jo Cohen, the general secretary for community affairs. “There are days when I feel like Don Quixote, tilting at windmills. But I live by the quotation framed beside my desk, “Rabot ra’ot tzaddik, u-mikulam yatsilenu Adonai. [Many are the obstacles the righteous face, and God will save us from them all, Psalms 34:2].” Cohen lights the Shabbat lamps in the synagogues every Friday. Two of her four children and six of her nine grandchildren live in Israel, where much of the community has resettled (there are also pockets of Indian Jews in New York, Los Angeles, Toronto, London and Sydney). Flower Silliman, 86, a chef who has preserved the community’s culinary cuisine in two cookbooks (Three Cups of Flower), traces her roots to El Ozer, Iraq, the site of the tomb of Ezra the Scribe. The family emigrated to Bombay and worked for the Sassoon family before settling in Kolkata at the end of the nineteenth century. Silliman lived in Jerusalem and Brooklyn before returning to Kolkata in 2009 with her daughter Jael, 60, an author (Jewish Portraits, Indian Frames: Women’s Narratives from a Diaspora of Hope) and former associate professor of women’s studies at the University of Iowa. 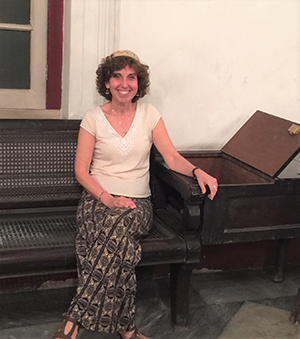 With partial funding from a Fulbright scholarship, Jael has created a digital archive, Recalling Jewish Calcutta, and a historical exhibit at Beth El synagogue. I always look forward to Rahel’s articles. This one was most moving. What a beautiful and meaningful visit Rahel has shared with us. Read today during Pesah, I felt a part of her revisit to her family roots. Thank you so much! I am privileged to be able to share my journeys with you.